At global positioning system (GPS) verification sign locations, mariners or owners of portable GPS units can validate their position and map datum settings. MSV and waterway managers have installed 16 GPS verification signs at boat ramps and jetties. Manoeuvre your GPS unit as close to the sign as possible. 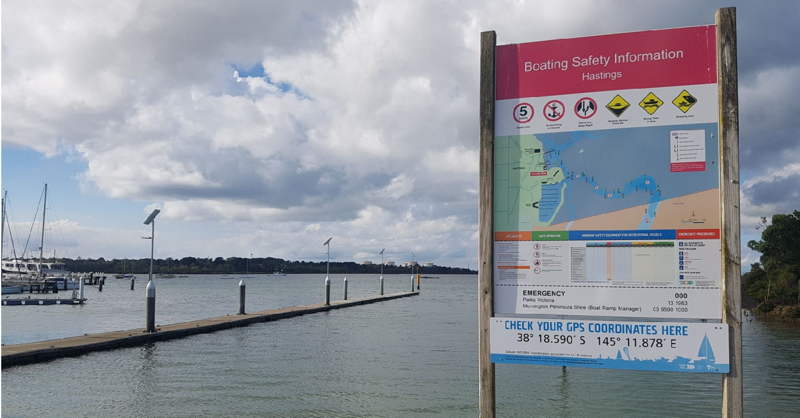 These signs are located as either stand alone signs or incorporated into boating safety information signs allowing you to position your vessel close to them. Ensure that your GPS unit is tracking at least five satellites and is set to the correct coordinate type (LAT/LONG) and datum (WGS84/GDA94). Make sure your GPS unit display coordinates match the surveyed coordinates of the sign. Agreement with the coordinates shown on the sign should be possible to within 15 metres or 0.008 minutes. Variations as to the information on the sign and what is displayed on the screen may be due to a number of factors such as proximity to the sign, quality of the receiver, placement of the GPS unit. If your navigation equipment displays a significant variance to the position displayed, check that your system is using a base datum of either WGS84 or GDA94. This information should appear during system start up or on a system settings/information screen. If your system is using the correct datum and still shows an inaccuracy of greater than 0.01 of a minute (see illustration above) you should contact the product manufacturer or retailer for advice.